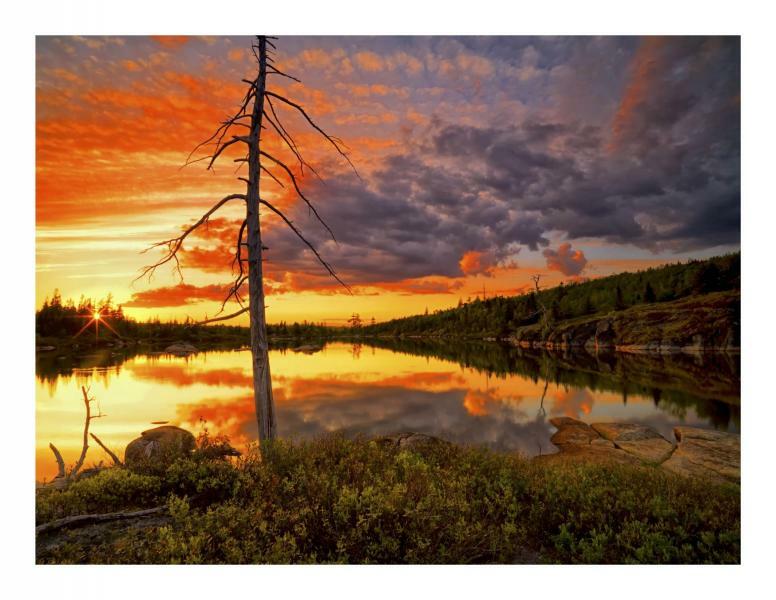 Development threatens Blue Mountain Birch Cove Lakes! Your help is needed to protect what could be the largest urban park in all of Canada. The long-promised but yet-to-be-delivered Blue Mountain Birch Cove Regional Park is under threat. It could be a mini-Keji for Halifax, but a terrible report from an independent facilitator, released in June, is recommending that a massive urban sprawl development be allowed inside the core of the future park. Immediately following the release of the flawed Independent Facilitator’s Report, Councillor Reg Rankin quickly put forward a very bad three-part motion for council to debate and a vote on. After several delays his motion comes up for the big vote at Council this Tuesday, Sept. 6th. In part one of the motion it seeks to replace the long understood Park boundary with a weak compromise that was clearly considered and discarded during the unsuccessful “facilitation” process. This is the mysterious Map 3A that was just released in a new Staff Report in advance of the vote. It is completely unacceptable. In part two of the motion it would allow “Secondary Planning” which the developers need to start the development process for the sprawling suburb they want to build on the most environmentally sensitive lands, all around the Birch Cove Lakes and precisely where HRM’s new park is supposed to be. In the third part it would unnecessarily hamstring the City to an arbitrarily short timeframe to complete the park. The land in question is zoned Urban Reserve and is not even supposed to be considered for development during the 25 year life of the Regional Plan (until 2031) if ever. Nevertheless the developers have relentlessly pursued every avenue to get around the rules and increase their development rights through repeated requests for “Secondary Planning” approval. It would be a different situation if HRM needed the land for places for people to live, but HRM already has 35 years worth of approved lots for growth in the existing serviced areas and does not need another big sprawling suburb. And, of course, the land has a much higher and better use – one that will become a centerpiece for a growing city now and in the future. A world class park for a municipality trying hard to be world class. But if Councillor Rankin’s motion goes through, that dream is over. The latest development: In preparation for the vote on Tuesday a new Staff Report has just been released recommending among other things that the Facilitator’s Report should be set aside as any basis for setting park boundaries, no approval of any Secondary Planning for the developers and that the city actually begin to actively acquire land for the park, correctly identifying that there are over a dozen other landowners who’ve never even been contacted about selling land. The Staff Report also reveals the mysterious Map 3A for the first time (see pages 47 & 48). As expected it’s an unacceptable compromise of semi-park, semi-suburb that will never fly. Council needs to be reminded again that the public is committed to having the Regional Parkcreated as promised and do not want to see it undermined for the benefit of a few well-heeled developers. Please make plans to come and attend this most important of Council meetings to watch Council and bear witness as they debate Councillor Rankin’s motion and ultimately put it to a vote. Again it’s this Tuesday, September 6th at 10AM at City Hall. It’s important to note that once the Park issue is “live on the floor” for debate any number of amendments or new motions could be put forward. This means no one knows exactly what will happen. Which is one of the reasons why a huge turnout from the public is needed. Please come and bring some friends. We need a really big crowd to send a really big message: The public is fully engaged and watching; Support the Park as originally promised. Click here for a brief history of the long and winding saga to create this park. Click here for a photo tour of what could be lost. 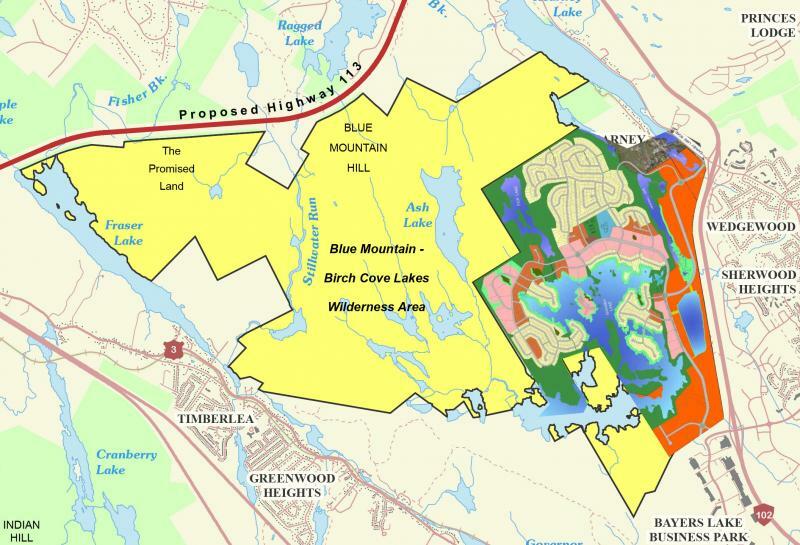 Blue Mountain Birch Cove Lakes is a long-promised but yet-to-be-delivered 2,000 hectare park located directly behind the Bayers Lake Shopping Centre and in-between Timberlea and Kingswood and just over the hill from Clayton Park. In most cities, you would have to drive for hours to experience this kind of Wilderness; in Halifax, it will be a short busride from downtown. Halifax Regional Municipality first committed to creating this park in its 2006 Regional Plan, but so far, the city has done nothing to fulfill the promise. 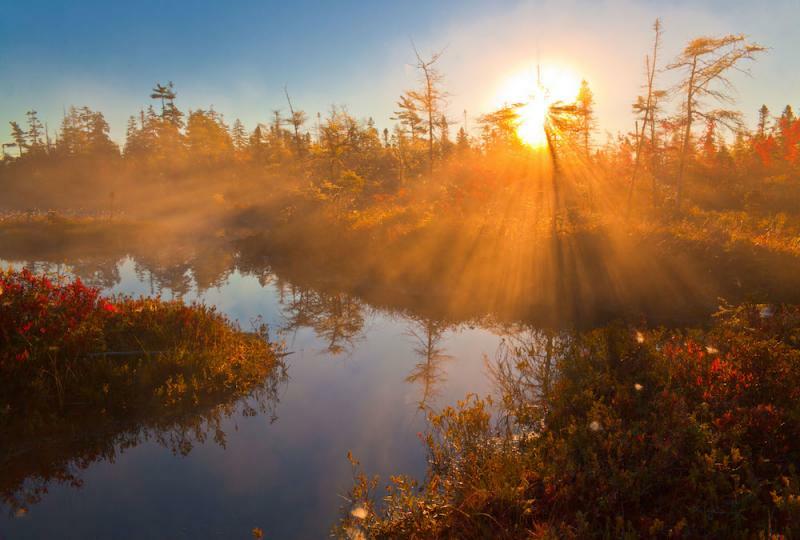 Based on this commitment, the Province of Nova Scotia designated 1,350 hectares of crown land as Wilderness Area in 2007 and a further 465 hectares in 2015—a significant, multi-million dollar contribution. In a 2007 press release from the Nova Scotia government, former mayor Peter Kelly confirmed there was an explicit understanding between the city and the province: “This will help us move forward with HRM's plans for a regional park in the area.” For both its commitment to the public and the province, Halifax Regional Council has a responsibility to complete what it started. Most of the last decade has been spent in unsuccessful negotiations with landowners to acquire the land. We call on Council to make public all maps, proposals and financial estimates put forward in those negotiations so that the public may have an informed dialogue on how best to move forward on achieving the park. We also call on Council to be steadfast in doing whatever necessary to achieve this long-promised natural asset. And we encourage you to let your Councillor know how much this park means to you. Read a full history here. The first map below shows the long-promised park (in green) with the developer’s plans (in colour) superimposed over it, inside the original boundary of the Regional Park. 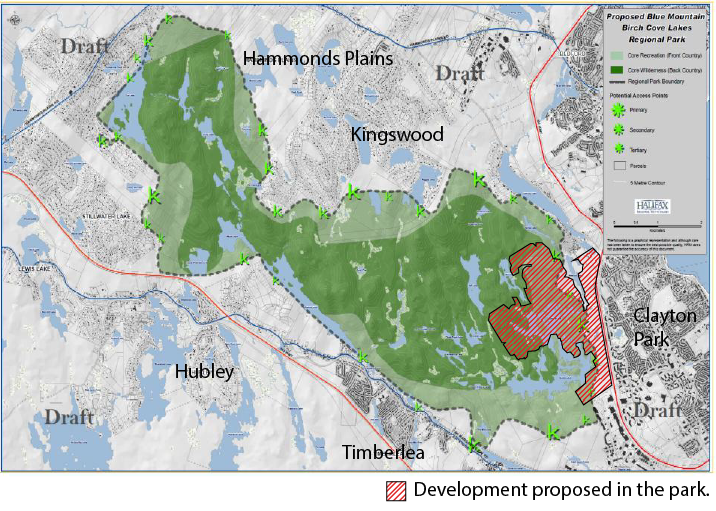 Below is the zoomed in view around Birch Cove Lakes area, showing proposed sprawl suburb inside the park and massed right up against provincially-protected Wilderness Area. This proposal would undermine the ecological integrity of the Wilderness Area and as a proposed boundary for the Regional Park is completely unacceptable. Halifax Examiner - Is Reg Rankin angling, Richard Butts-style, for a job at the Annapolis Group? Halifax Magazine - Fighting for a promise.